We are a company located in Llanes, specialized in trekking and hiking routes of 1 or several days in the Picos de Europa National Park and the surrounding mountain ranges. Another of our specialties is the descent of ravines with all kinds of variety in both difficulty and duration. 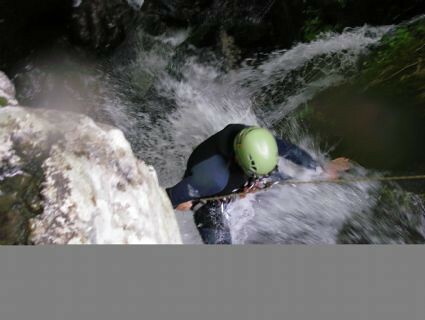 We also do canoeing down the Sella and Cares-Deva rivers and speleology routes in all types of caves. We do not only carry out the activities, but we take care of finding you accommodation in the area in hostels, Casas de Aldea, 3 hotels and 4 stars, etc. Rumbo a Picos offers a program of activities designed to enjoy some vacation in contact with nature and live small family adventures. You can perform these activities with children from 7 years. Request information on the dates planned for this summer 2018. Before 105 € now 90 € person. If you are going to spend several days in the area and want to enjoy the Adventure, this is your Pack. You can make this Pack in two days or 3 days and they do not have to be consecutive. This package of activities is designed for families with children from 10 years or 1,40 of stature. We always go in small groups and we do not mix with other types of clients, in this way children get together with others and have a great time. They are initiation activities to enjoy and have fun and without the need of experience and all are accompanied by qualified guides. You can make this Pack in 3 days and they do not have to be consecutive. Canoe down the Cares-Deva river // Caving // Initiation to the descent of canyons. Before 70 €, now 60 €. If you like activities related to water, this is your Pack. To make this Pack, you need at least 2 days, but they do not have to be consecutive. Before 165 €, now 140 €. This pack of 4 activities will allow you to fully enjoy the region. 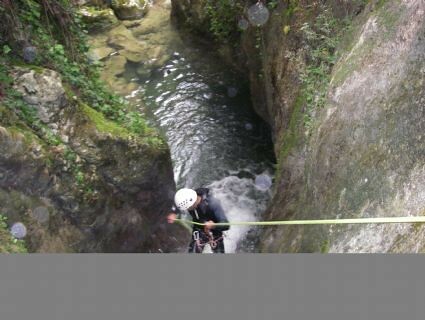 Includes descent of the Sella // Descent of ravines level 1 and 2 // Speleology // Vía Ferrata. You will be accompanied by certified guides and includes all insurance and VAT. 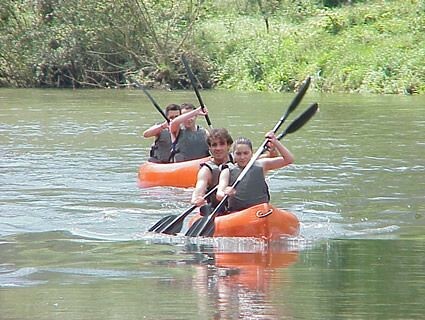 We will descend the salmon rivers Sella and Cares-Deva in two-seater canoes enjoying the adventure and nature. It is required to know how to swim. Throughout the tour we will observe salmon and trout jumping, herons and egrets and mouse eagles. We will also have to avoid and enjoy the rapids of the river, stopping to eat on the shore and giving us a good dip. The route is 10 Km and it takes about three hours. The canoes are very stable and you do not need experience. An authentic enjoyment of descent that surely we will not forget. Descent from Cares 1 to 20 people: 30 €. VAT included. TRAILSWe have a variety of routes of different difficulty and number of days. Some of the routes we organize are: La Ruta del Cares, Circuito Lagos de Covadonga, Naranjo de Bulnes, etc. 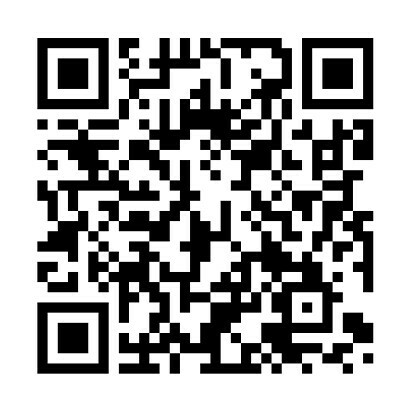 You have detailed information of all our routes and hiking trips in Hiking in Picos de Europa / y Adventure travels PRICE: From 45 €. DESCENT OF BARRANCOS. This is one of our specialties, small groups, variety of ravines adapted to climatology and experience, etc. 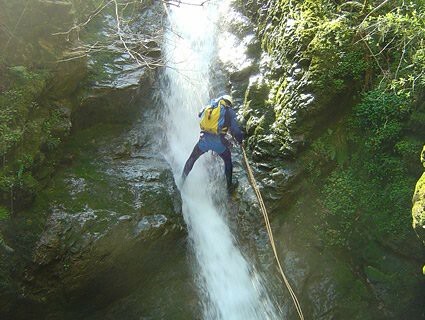 You have detailed information of all our descents in Descent of ravines in Asturias PRICE: From 40 €. CANOE DESCENDS: You can choose between descending the famous Sella River or choosing another less crowded one like the Cares-Deva. Daily departures with different schedules. Detailed information: Canoe drops PRICE: 27 €. Speleology: Asturias is full of wild caves, we take you to one of them and you will become a speleologist, exploring the incredible underground world. Detailed information Caving in Llanes PRICE: 35 €. VIA FERRATA: Feel like a climber with this new activity. A via ferrata is an itinerary equipped with different materials, with a harness, helmet and dissipating belt you will discover unreachable landscapes. 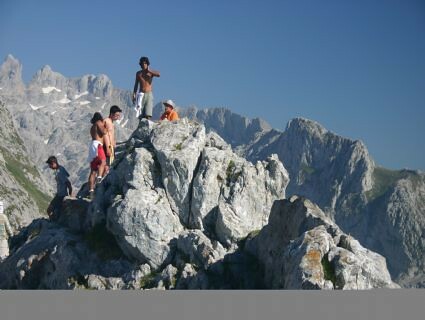 Detailed information: Via ferrata La Hermida PRICE: From 50 to 80 €. ESPELEOBARRANQUISMO: Consists of making a descent of ravines inside a cave. Undoubtedly, the adventure at its best. Detailed information: Espeleobarranco Purón PRICE: 60 €. 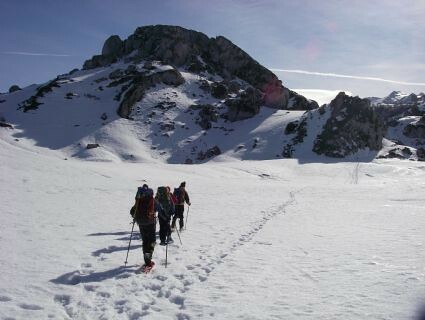 SNOW RACKETS: Enjoy the best snowy landscapes of The Picos de Europa. With snowshoes and without previous experience you can discover the winter mountain and its magic. 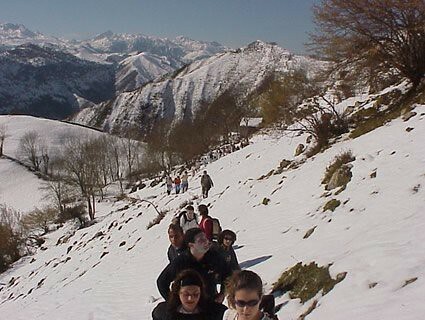 Detailed information: Snowshoes in Asturias PRICE: 45 €. 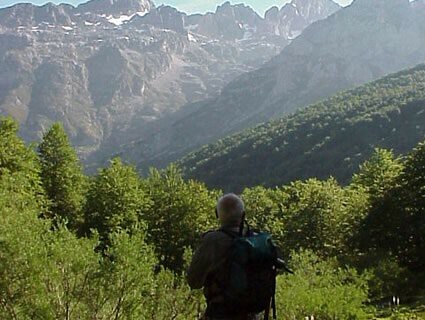 The characteristics of the Picos de Europa with an average altitude between 2.000 and 2.500 mts above sea level and its proximity to it, only 15 Kms., Cause the rivers to descend by some vertiginous slopes, forming a multitude of waterfalls, jumps, pools, etc. We will descend the enchained channel of one of these mountain rivers, dressed in neoprene suits. It is the most attractive activity for those who seek to download adrenaline and feel the emotion of an authentic adventure. This activity combines climbing and swimming techniques. The descent will be full of emotion, with various rappels, jumps, slides, detours, etc. The duration of the activity is about five hours, although the actual decline lasts two and a half hours. 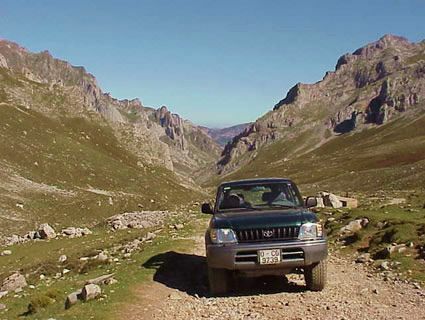 To make it easier, we organize all kinds of excursions, with specialist guides in the area, we prepare food for you and we put a vehicle that will vary depending on the number of people in a minibus, van or off-road, so you forget the logistics and just Enjoy a wonderful day in the mountains. Includes: specialist guide, compulsory insurance, necessary materials, picnic lunch, transport from Llanes in minibus, van or SUV. Via ferrata el Beyu through the cave (Media). Excursion to Covadonga, the Lakes, cider winery and panoramic of the coast. 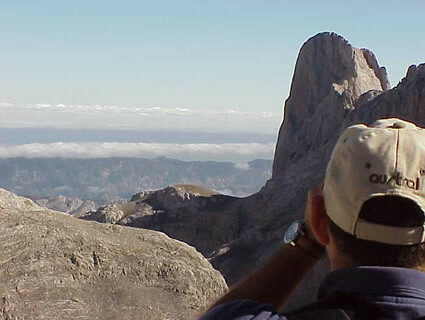 Panoramic excursion of the Naranjo de Bulnes, Quecos Cabrales cave and the villages of Sotres. Excursion to Potes, Fuente Dé, Monastery of Santo Toribio de Liébana and the pre-Romanesque Church of Santa María de Lebeña. Punctuation: 7.5. of 2 votes. 10 answers to "Towards Peaks"